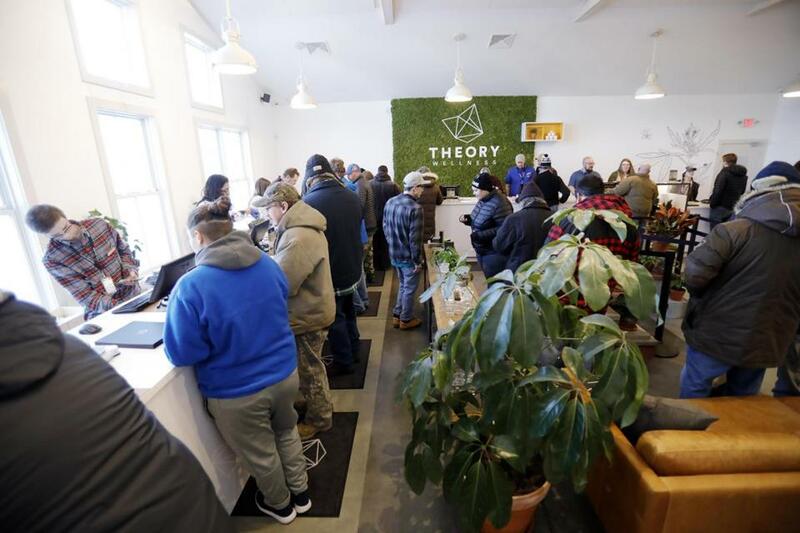 Customers crowded into Theory Wellness in Great Barrington on Jan. 11, the first day of its recreational marijuana sales. Customers spent nearly $24 million on recreational marijuana products in the first two months of sales, according to data from the state’s Cannabis Control Commission. From Nov. 20 — when the first two recreational stores opened, in Leicester and Northampton — to Jan. 20, customers spent $23,819,602. There are now eight recreational stores open in the state, and a ninth store, in Hudson, has its “commence operations” notice from regulators but has not announced an opening date. Revenue was about $3.4 million last week, a record weekly total, according to data from the commission. This past weekend also hit a record for the largest single-day revenue figures (though the weekend also saw one of the lowest revenue days so far). The nearly $24 million gross sales total does not include taxes — 17 percent for the state (a 6.25 percent sales tax and a 10.75 percent marijuana excise tax) and 3 percent for the municipality. So far, the state has received about $4 million in tax revenue.